It's all me, says President Donald Trump, without saying exactly those words. He never acknowledged losing anything in his two-hour-plus Wednesday news conference about Tuesday's mid-term elections when at least 29 GOP seats in the House of Representatives flipped to Democrats (and only one turned from blue to red). He made nice about Nancy Pelosi and offered to work across party lines. But he made threats, too: He said he would take "warlike posture" if House Democrats investigate him, vowing to retaliate if they try to probe his finances and political dealings. He said Democratic control of the House might make things easier for him because he could "blame" Democrats when things don't go his way. He took credit for gaining two (there might be one more) Republican seats in the Senate, and actually mocked the GOP Senate members whom he claimed he "retired," as well as those who lost because they rejected his campaign "embrace." He took no credit for the GOP losses, but was quick to say that Republicans who supported his policies won. "Those that did not, 'say goodbye,'" he taunted. 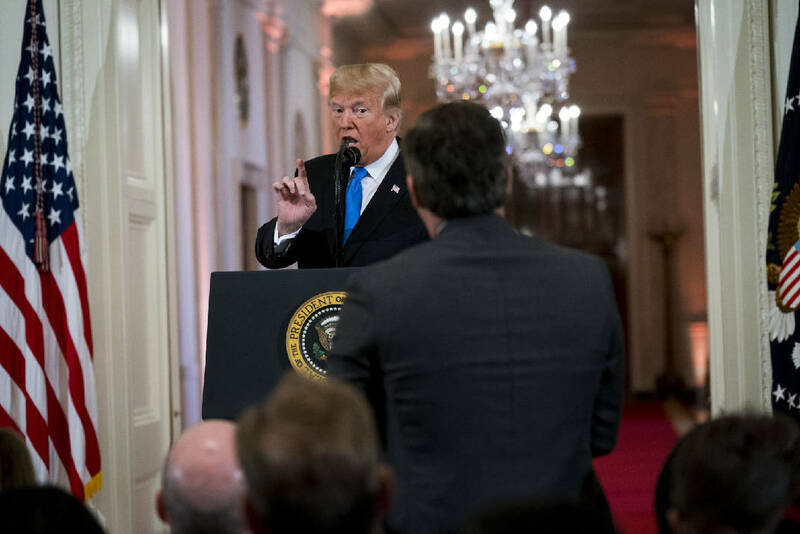 And, of course, he reverted to vilifying the "nasty and hostile media," actually shouting down some reporters — particularly CNN — who were trying to ask questions. Truth be told, on stage there, thrashing the media was really the only way Trump could lash out and show what has to be great disappointment. At least until after the news conference when he could turn his dismay toward seeking and accepting Attorney General Jess Sessions' resignation. Even that was suspect: It offered Trump a way to change the election headlines from things such as "How the House Fell; Republican Chaos and Democratic Focus." But make no mistake: There was a blue wave. Our country has 435 congressional districts. Of those, 313 swung to the left when residents voted more Democratic in this election than in 2016. Only a few dozen districts shifted to the right of their 2016 voting records. As a result, Democrats won at least 222 seats to Republicans' at least 199. A few races were still being tallied Wednesday, according to national news organizations, but the House is solidly in control now of Democrats — needing only to reach the magic number of 218. Most of the movement came in suburbs and from women. According to one Washington Post analysis: "To underscore just how much of a drag Trump was in the suburbs of Kansas City, an openly lesbian Native American who used to be a professional kickboxer named Sharice Davids toppled Rep. Kevin Yoder (R-Kansas)." Nationally, preliminary exit polls show that women voted for House Democrats by a 21-point margin, 60 percent to 39 percent, while men split — 48 percent backed Democrats and 50 percent backed Republicans. Independents were key, as well. By a 13-point margin, they voted for congressional Democrats, even though in 2016 they favored GOP candidates by a 4-point margin. And yes, it was the year of the woman. More than 100 women were on track Wednesday to win seats in the House, breaking the previous record of 84 out of the total 435 congressional districts. Overwhelmingly they were Democrats. But Trump was having no losing. And he was having even less of the humility shown by Bill Clinton, George W. Bush and Barack Obama following their major midterm losses in 1994, 2006 and 2010, respectively. Bush called his midterm election loss a "thumpin'. " Obama's term was a "shellacking." Trump called it "a big night." It is the House of Representatives that holds the keys to presidential oversight. And this president has had none of that. Plenty of editorial pages Wednesday morning were calling for Democrats controlling the House to use constraint — take it slow — and show bipartisan spirit. A Democratic House not only can block Trump priorities such as building a wall along the Southern border, it can also use subpoena power to investigate all manner of issues — including Trump's tax returns, his business deals and ties with Russia that the current GOP-controlled House prematurely closed. We're all for being bipartisan, but we are not for "taking it slow." We're with Rep. Eric Swalwell, D-California, and a member of the House Intelligence Committee, who said on NBC News on Wednesday: "We'll fill in the gaps on the Russia investigations. The American people will see his tax returns, not because of any voyeuristic interest, but because they should know if he is corrupt. And we will look at the cashing in of access to the Oval Office and his financial entanglements overseas." More dangerous for Trump is the power of the Democratic House to dangle the I-word — to impeach him, even if House members would not be able to muster the two-thirds vote required for conviction in the Senate. But don't you wonder if that's not a factor with the dumping of Sessions? What's the next shoe to fall? And how will the Senate feel about the treatment of its alum, former Sen. Sessions?